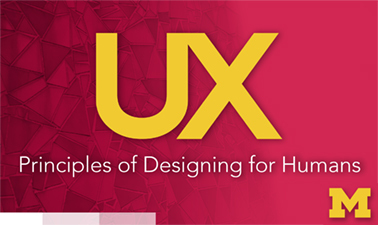 In this UX course, we will survey theories and findings from the social sciences (especially psychology); with special attention to how these concepts influence the way we design for human interaction. We will cover how people perceive and process information, motor capabilities and limitations, decision-making and problem solving, and how emotion and social factors impact user experience. We will also cover best practices for designing systems to align with how people work. It was great thank you very much, I have learned so much about human psychology, how they see web pages, good and bad design, contrast. Wonderful amount of knowledge in this class. I enjoyed getting an overview of how us Humans see and how that applies to UX Design. You will get an excellent foundation on needed knowledge for anyone in UX called the 7 stages of action, the gulfs of execution and evaluation, and the 10 design heuristics. If you ask me Mark teaches those topics better then Don Norman does. :) The heuristics evaluation assignments towards the end of the class are so useful and helpful for the real world. Reading how other students did is very helpful as well. course content is very useful, external references are provided.Prof Mark W. Newman has an excellent way explaining the subject. I have taken each course in the UX MicroMasters program so far. These courses are fantastic, and Prof. Mark Newman's lectures are clear and concise, but still packed with plenty of detailed examples that you feel like you walk away truly understanding the topics from many levels. The projects at the end of the course build on everything you've learned. I do feel that I have gained valuable information that makes me see things in new ways, especially through a critical lens, and I can apply it all to improve and help create great products and experiences.